Powerful Team USA has emerged as favorite in overlooked World Cup. It's one of the best-kept secrets in baseball, but if Bryce Harper joins the fray, that's likely to change in a hurry. But it's not to say Harper - baseball's latest highly-touted uber prospect - will be the make-or-break factor of the World Junior Baseball Championship in Thunder Bay, Ont this summer. It would just be icing on the cake. 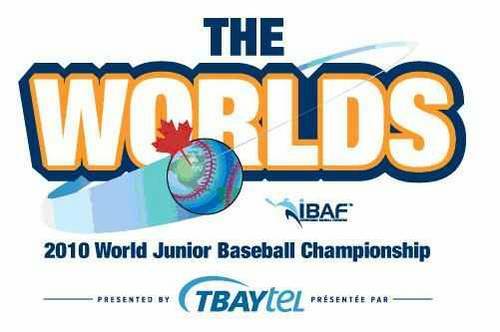 "In large measure, the tournament's never had the marquee player coming in," said Warren Philp, executive director of the Thunder Bay International Baseball Association (TBIBA). "Even without him, it's a great tournament. "And it will be a great tournament moving forward." When perusing the list of MLB stars that have participated in the event, billed as baseball's equivalent to the hockey and soccer junior championships, it's a bit of a mystery as to why the tournament has not received more attention in years past. Alex Rodriguez, Joe Mauer, Justin Morneau, and Larry Walker are just a few of the players who have represented their country in the 12-nation tournament featuring the best 18-and-under baseball talent in the world. "This event, when you peel it back, it's exactly like World Junior Hockey, it's exactly like FIFA 20 Soccer," Philp said. "But for baseball, it's been buried in obscurity. It deserves a much higher profile." Philp says organizers are anticipating approximately 20,000 people to attend the event, a number he contends is on the conservative side. "The history of this event is that it's really tough to forecast attendance numbers," explained Philp. With an estimated five percent coming from out-of-town visitors, the number is sure to grow if Harper, the projected No. 1 overall pick in the MLB 2010 draft in June, suits up for the United States. The 17-year-old Harper expressed his desire to play in the championship in a recent interview with MLB.com, but it remains to be seen how things will play out following the draft. It's not that the TBIBA, the tournament's local organizing committee, feels as though Harper is the key to the event's success because, by and large, they don't. After being selected by the International Baseball Federation [IIAF] to host the juniors, Philp said the TBIBA immediately focused their attention on studying other major tournaments of a similar stature. The goal was to find a template of success and build from there. "When it was announced that we got the right to host this event in November 2006, I went to the American Baseball Coaches Association [ABCA] in January in Orlando," Philp said. "When I went there I talked to Eric Campbell [general manager of USA Baseball national teams]. He said 'If you're interested in studying the best practices, Warren, look at the College World Series in Omaha'." Philp said organizers behind the Omaha tournament have been more than accommodating in sharing information, while providing the TBIBA with the type of peripheral insight that goes into staging a major international event. It was learning the "hosting component" that, according to Philp, is the key to making the event successful from more than just a baseball perspective. "We are looking at 12 service clubs, or ethnic-based organizations, to host each of the 12 teams," he said. "So that those teams come away from the tournament saying, 'Not only was it a great baseball tournament,' but also, 'We really connected with the community'." "For those people that don't know much about baseball, we are selling it as a major cultural festival. We will be having entertainers, artisans, adding to the mix on the main street adjacent to Port Arthur Stadium. "There will be more than just baseball." It's all culminated in what Philp believes is the chance for Thunder Bay to separate itself as one of the central cities to host future international sporting events, specifically baseball, in Canada. Also included in the plans is a "FanFest" similar to the one held at the MLB All-Star Game, components of which will be provided by the MLB to Thunder Bay for the tournament. "Major League Baseball International has taken some interest in it, they recognize it's the biggest international baseball tournament in the world this year," he said. Canada's head coach and director of national teams, Greg Hamilton, said for the players involved, it's a once-in-a-lifetime opportunity. "All things being equal, it's really special to play at home because kids get an opportunity to play in front of a partisan Canadian crowd," said Hamilton, speaking from the Atlanta Braves spring training facility at Disney in Orlando, where the team just wrapped up a 10-day workout. "For these kids, it's the first time in their lives they really get the significance of wearing Canada across their jersey." There will be 46 games played over 10 days of competition, beginning July 23 and running through August 1, in order to determine the world champion. Korea will be looking for its third straight title, while Team USA and Cuba, the 2008 silver and bronze medallists, remain serious contenders to win the event. Canada, which won the event in 1991, captured the bronze medal in 2006. "Offensively, we've got some big strong kids," Hamilton said. "The strength of our club should be on the mound, which is a good thing." Having now hosted the past two Worlds (Edmonton in 2008) and with the emergence of major leaguers such as Morneau and Jason Bay - among others - Hamilton said he is encouraged by the strides Canadians are making in baseball. It's a trend he expects to continue. "The upper-end talent is certainly as good or better than it's probably been historically. There are more quality players than there have ever been. There's a real depth of current and next generation players coming. "The next wave of guys that are potentially going to impact the game at the next level could be significant from a numbers prospective." Not only is it a chance to help grow baseball in Canada, but with a projected $6 million boost to the Thunder Bay economy, Philp is excited for the impact the tournament will have on the city. "It's all about what sort of legacy do you leave with the teams. How does that come back and benefit your community moving forward?" The teams are coming and, for now, that's all that matters.